Skype on browser : Make Skype Calls from Email Client (OutLook.Com) | Free Pc to Phone Calls, Free Voip Calls to India International ! Seems the takeover of Skype by Microsoft is showing its effects, offcourse the positive ones. Many of us use our gmail account and use it for sending emails, chatting with friends, talking (audio and video calls) with friends using the gtalk client. Such a audio video calling feature was lacking in the Microsoft email client (Outlook.com). It is a free personal email service from Microsoft and is quite widely used. Infact in just six months after its launch, it attracted 60 million new users. Microsoft in an attempt to match the Google support and bring the audio/video calling support has coupled Skype with Outlook.com. This is basically a preview version of Skype currently available for United Kingdom and will be made available in the United States and Germany in the coming weeks. Obviously email is important and nothing can get rid of this, but sometimes it is much easier to talk then text or write long emails. And if you get the flexibility of video calling then its just awesome. So with Outlook.com (directly from your mail client) you have the option of sending email or instant messaging and now video or audio call. Inorder to setup skype for outlook.com, you need to download a plugin for your browser (which is available for IE, Chrome and Firefox). 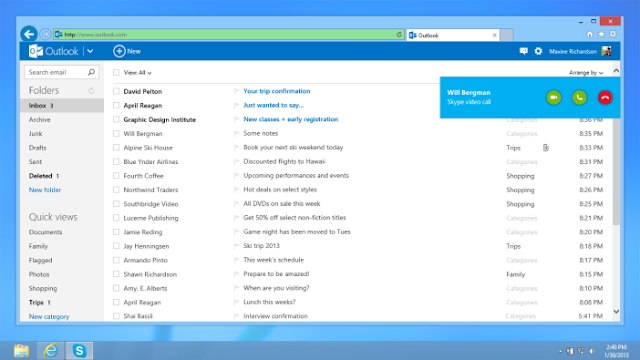 Once you have downloaded the plugin you can connect Skype to Outlook.com (using your microsoft mail account). If you already have a skype account then you will be asked to link both of these. Just merge your Microsoft email account with the Skype account and you are ready for video calling. You also have the option to add all your Skype contacts to outlook. Making calls with Skype is damn easy. Click on the Skype audio or video buttons in your IM conversation. To start a call while reading an email from a friend on Outlook.com, move your mouse over the friend’s picture and click on the Skype audio or video call buttons that appear above his or her contact details. Earlier we have seen the merger of Skype account with Facebook and it was a big hit. I mean life gets simple when you remove the complexities (in this case managing so many account) and this move by Microsoft is a great step going forward. I am hoping Skype roll out this feature worldwide, so that everyone can get benefited from such feature. I am not wondering why voip softwares like Viber and Whatsapp not thinking in this direction and not rolling browser based calling or a PC app.